Moscow - The history of the great Russian city of Moscow begins in 1147. In that year, Yuri Dolgoruky, a prince of Kiev, is believed to have built a grand hall at an outpost on the Moskva River where it meets the Yauza. There he held a large banquet for friends and allies. "Come to me brother, come to Moskvă" (though I cannot find the the chronicle referenced). The city likely takes its name from the river on which it sits and which as been so central to its development. Nine years later (1156), Prince Yuri built a fort to protect his hall; the first Kremlin (the word simply refers to a fortified structure). However, the nascent city did not survive the Mongol Horde, which burned it to the ground in 1238. Genghis' grandson, Batu Khan invaded the Rus' in 1237 and subjugated the region by 1240. The city was rebuilt around 1260 by Alexander Nevsky, another prince of Kiev (Kiev is even older than Moscow and originally dominated the Rus'), but it remained a vassal of the Mongol Empire for decades. It finally broke the Mongol yoke in 1380 at the Battle of Kulikovo. The Muscovite army was led by a prince named Dmitry who thereafter became known as Dmitry Donskoy ("of the Don"). The victory did not liberate all of Russia, but from that point, Moscow took the lead in the struggle to free the land from the Tartars (the name given to the people who were of Turkic-Mongol blend). Exactly a century later (1480) liberation of the Rus' was completed by Ivan III and Moscow emerged as the capital of the newly formed Russian Empire. 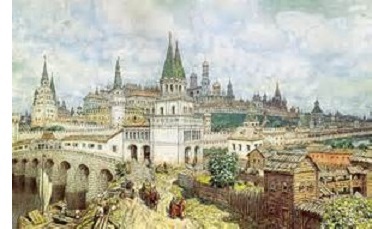 By 1500, the population of Moscow was 100,000 and it had become a major European city.